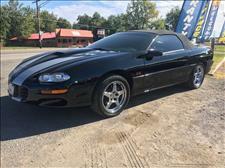 I wanted to take a moment to thank Tom Brown and his mom Marie for the great experience I had in recently purchasing a 2000 Camaro convertible from their Dexter MO dealership. I purchased the car site unseen as I live in Florida. Tom was very friendly and professional. He answered all my questions and was very upfront about everything. He is a man of his word and made me a great deal. Marie is very friendly as well and handled all the paperwork very quickly. They both went the extra mile to make this an easy deal. Tom kept me posted as I had to have the car shipped from the dealership to Florida. I got the car this week and it is even better than Tom had told me. We are thrilled with our new purchase and the dealership as well. If you're looking for a good deal and fair and honest people to deal with then I highly recommend these folks. Thanks again Tom.